A Third Circuit panel has established a new "clear evidence" standard of proof in vacating and remanding a lower court’s decision that dismissed multi-state claims again Merck Sharp & Dohme Corporation’s drug Fosamax® on a preemption basis. In its decision, the appellate panel noted that preemption is an affirmative defense and found fault with Merck’s subsequent arguments that it was entitled to the defense. Under the "clear evidence" standard of proof, the individuals involved in the litigation had provided sufficient evidence that a reasonable jury could conclude that the Food and Drug Administration (FDA) would have issued warnings about Fosamax. The district court failed to take this into consideration, according to the panel (In re Fosamax (Alendromate Sodium) Products Liability, March 22, 2017, Fuentes, J.). Background. The FDA approved Merck’s new drug application (NDA) for Fosamax, which belongs to a class of drugs known as bisphosphonates, in September 1995. When Fosamax was approved at that time for the treatment of osteoporosis in postmenopausal women, the FDA did not require Merck to include a warning about bone fractures. Nor did it do so in 1997, when it approved Fosamax for the prevention of osteoporosis in postmenopausal women. 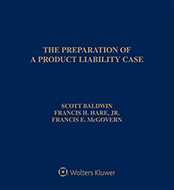 Beginning in 2010, hundreds of products liability suits were filed by individuals from multiple states alleging that they suffered bone fractures because they took Fosamax to treat and prevent osteoporosis. The individuals alleged that by slowing the body’s resorption process, whereby bones are continuously broken down and reformed by the creation of new bone cells, Fosamax increased the risk of certain bone fractures. Generally, an insufficiency stress fracture is one caused by normal loading of poor-quality bone. Typically these fractures can heal on their own, but the individuals alleged that Fosamax prevented repair of these normal fractures. Specifically, they alleged that they developed atypical femoral fractures, which are severe, non-traumatic, low-energy, complete fractures of the femur that develop after Fosamax reduced bone toughness in individuals who had insufficiency stress fractures. The individuals further asserted that Merck was aware of the risk of such fractures but acted unlawfully by failing to warn doctors and patients of those dangers. After consolidation, following discovery and trial, the district court granted Merck’s motion for summary judgment and dismissed all claims on preemption grounds. The district court’s ruling was based on the U.S. Supreme Court’s decision in Wyeth v. Levine, 555 U.S. 555 (2009), which held that state-law failure-to-warn claims are preempted when there is "clear evidence" that the FDA would not have approved the warning that a plaintiff claims was necessary. In the intervening years between Fosamax’s approval and an October 2010 FDA warning label requirement for all bisphosphonate manufacturers to add information regarding atypical femoral fractures, Merck was made aware of the potential links between the two. Thus, the primary question for the appellate panel was whether prior to September 2010, when the FDA determined that there was evidence of a specific type of bone fracture with long-term use of Fosamax, would the agency have rejected an earlier attempt by Merck to unilaterally amend the Fosamax label to include a warning about the risk of atypical femoral fractures. "Clear evidence." The Third Circuit concluded that the Supreme Court in Wyeth intended the term "clear evidence" to denote a standard of proof. Under Wyeth, the "clear evidence" standard is fact-sensitive and demanding. The Wyeth court, however, did not define the "clear evidence" standard or explain how courts should apply it. The only guidance the Supreme Court offered was to call impossibility preemption a demanding defense. The Third Circuit noted that other appellate circuits have decided preemption cases by simply treating the facts of Wyeth as a yardstick—if the evidence for FDA rejection in a given case is less compelling than the manufacturer’s evidence in Wyeth, then there is clear evidence that the FDA would not have approved a label change and the manufacturer’s preemption defense fails. Although many district courts have adopted this approach, some have added a layer of complexity by surveying post-Wyeth case law and testing the facts of a current case against these prior decisions. Consequently, the Third Circuit held that the Supreme Court in Wyeth intended to announce a standard of proof with the use of "clear evidence," and that the standard required the factfinder "to predict a highly probable outcome in a counterfactual world and, therefore, require[d] a court sitting in summary judgment to anticipate both the range of conclusions that a reasonable juror might reach and the certainty with which the juror would reach them." Additionally, The Wyeth Court articulated the "clear evidence" exception as follows: "[A]bsent clear evidence that the FDA would not have approved a change to [drug maker’s] label, we will not conclude that it was impossible for Wyeth to comply with both federal and state requirements." According to the Third Circuit, this formula has three components: (1) a legal rule defining the circumstances in which a manufacturer is absolved of state-law liability (the impossibility defense whereby a drug maker cannot comply with both federal and state requirements); (2) a factual showing that satisfies the legal rule (the FDA would not have approved the proposed label change); and (3) a standard of proof that specifies how convincing the factual showing must be ("clear evidence"). As such, the Third Circuit noted that "clear evidence" did not refer directly to the type of facts that a drug maker must show or to the circumstances in which preemption was appropriate. Instead, the Third Circuit held that "clear evidence" specified how difficult it would be for a drug maker to convince a court or jury that the FDA would have rejected a proposed label change. This was not simply by a preponderance of evidence, but the new standard of "clear evidence." The Third Circuit further noted that its conclusion was supported by previous Supreme Court usage of the term. Thus, the Third Circuit concluded that in order for a defendant to establish a preemption defense under Wyeth, the factfinder must conclude that it is highly probable that the FDA would not have approved a change to the drug’s label. Jury determinations. Merck made two arguments: (1) that the vast majority of courts applying Wyeth have assumed, either explicitly or implicitly, that Wyeth preemption presents a question of law and (2) that conflict preemption is always a question of law. The Third Circuit found the former argument only partially accurate and not persuasive. Although it was possible to characterize the Wyeth preemption approach as a tacit acknowledgment that the "clear evidence" test is a legal question to be answered directly by the court, the appellate panel stated that was not evidence as to why the Wyeth test should be resolved by a court in the first place. As to conflict preemption, the Third Circuit found that this could be a fact question for a jury. Supreme Court precedence in which the high court defined the scope of conflict preemption in a specific setting provided the appellate court with the basis for its finding. In Boyle v. United Technologies Corp., 487 U.S. 500 (1988), the Supreme Court had held in litigation involving design defects of military equipment that the proper question on summary judgment was whether a "reasonable jury could, under the properly formulated defense, have found for the petitioner on the facts presented." The Supreme Court further added that it would be error for a court to assess on its own whether a defense had been established. The Third Circuit stated that it had not gone so far as to declare that any one species of preemption defense categorically required a jury to answer factfinding questions, but that there were instances the circuit had acknowledged that the availability of a defense could turn on questions of fact. FDA approval. Consequently, the district court was required to anticipate both the range of conclusions that a reasonable juror might reach and the certainty with which the juror would reach them. Predicting the FDA’s likely actions requires multiple assessments of FDA officials’ motives and thought processes. For instance, inquiries about motive or state of mind would be needed, including what were FDA officials thinking, and how would that disposition have conditioned their response to a hypothetical proposed warning. The Third Circuit stated that questions of motive, intent, and state of mind are typically fact questions committed to a jury and not a court. The Third Circuit also rejected Merck’s contention that even if the Wyeth inquiry was a fact question, the court should answer the question and not a jury for reasons of institutional competence. The court disagreed and stated that Merck’s argument missed the purpose of the nature of the factfinder’s task under Wyeth. Instead, the factfinder’s task is to predict how the FDA would have reacted in a hypothetical scenario; thus, the jury is not asked to construct an FDA label regulation, but asked to apply the requirements of that regulation to the facts, in aid of a prediction as to the FDA’s behavior. The individuals in the suit produced sufficient evidence for a reasonable jury to conclude that the FDA would have approved a properly worded warning about the risk of bone fractures—or at least conclude that the odds of FDA rejection were less than highly probable. Under Wyeth and a "clear evidence" standard of proof, that was enough for the individuals to defeat summary judgment and proceed to trial. The case is No. 14-1900. Attorneys: Edward Braniff (Weitz & Luxenberg PC) for Doris Albrecht. Andrew T. Bayman (King & Spalding) and John H. Beisner (Skadden, Arps, Slate, Meagher & Flom LLP) for Merck & Co. Inc.
Companies: Merck & Co. Inc.